... would smell as sweet. In other words, Liesl Take 2, with two very bad photos to show for it. Taken in one of the upstairs bathrooms because of the mirror there. Big and just cleaned by me. However, there's a strong light through shower recess open window at one end and a dark door and shadows to part of the upstairs hall at the other. Not a good combination for photos and I am not good at getting photos using the mirror.. However, son and DIL were out till this evening. I don't normally wear this or related colours myself although I like them. I was pleasantly surprised to see that I didn't quite look like death warmed up wearing this colour. It's made from Jet which I like using and the buttons are flowers with yellowy-green centres which go well with the colour of the Jet. I bought them at Greta's at Lindfield. I used just under nine 50 gm balls. I'd bought a pack of ten balls from a Morris and Sons sale and picked up another couple of balls elsewhere, thinking I might need them. 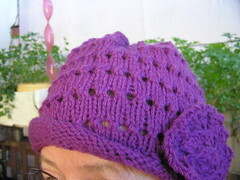 I think I'll make some beanies for Victorian fire victims with the leftovers. Despite what photos seem to show, the cardigan does fit me and do up and hang well. I usually have no problems with wool or alpaca at all on my skin and frequently wear woollen jumpers with no shirt underneath. However yesterday I spent quite a few hours in the garden. I clipped the overhanging plants along the highway and down the side street footpath. I attacked the cotoneaster which overhung a large part of the driveway. I ripped out a lot of fishbone fern which was growing in the cracks in one of the sandstone retaining walls and also up beside steps from drive to front yard. That gave me lots of scratches and bruised my fingers. I trimmed all the scorched bits out of several shrubs which had almost died in those heatwave days when the Victorian fires were bad. Then I cut all that up into the green waste bin as much of it was not suitable for compost. Son and I cut down a couple of large branches which had sagged badly in the rain and were causing problems for people walking on the footpath. Some bits were actually rubbing on cars on inside lane of the highway. Then he mowed all the lawn which took him over two hours, this is a large uneven block. Now I also have psoriasis which is not usually bad and I can usually control it However, in autumn and spring and at times of stress it flares. Put all of this together and I itched and scratched all night. I should have got up and found some anti-histamine tablet but it's been so long since things were this bad that I didn'teven think about it. So when I put on the cardigan there was instant irritation and I pulled it back as much as possible from my skin. I could not face more feather and fan stitch at the moment. I worked out the increases and did a stocking stitch yolk, then found a four row stitch pattern which fitted into the stitch count. It's called peacock tails or fans or plumes. Can't remember the details. 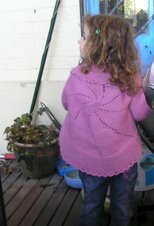 This cardigan is a quick knit and no seaming at the end is wonderful. This time I remembered to do the sleeves first, so I did not have a great lump of knitting to manoeuvre as with the pink model I did earlier. Another adaptation to the original pattern was a couple of rows of garter stitch around the bottom and I cast off on a wrongside row so it does not show. Ooo! hope you're feeling a lot better soon. Can't stand pure wool next to bare skin myself! It doesn't bother me to knit with it but put it on and it drives me crazy! Obviously the skin on one's hands is a lot less sensitive than that skin on the underside of the arms! It looks lovely! Love the colour. Just beautiful. I'm just so close to making this myself! I agree; it looks lovely on you! No wonder you were scratchy after all that gardening - just the thought of it makes me feel a bit scratchy! It looks lovely - I sympathise with the psoriasis - I had a flare up after strep throat and it drove me mad - hope you are better soon - happy Easter!